Successfully Added LITAKE LED Sound Crystal Magic Ball Stage Party Light 2PCS 7 Colors US Plug-Black to your Shopping Cart. 3 MODES: Auto Mode / Sound Active Mode / Strobe Mode. Auto Mode Creates a dreamy, relaxed atmosphere when plugged in. Sound active, light changes with the beat of the music, increase the dynamic and fun. Strobe mode can be used as a strobe light, invite your friends to enjoy a different party together! UV LED BLACK LIGHT: Creates special lighting effects that make fluorescent body paints and ink, cosmetics, bubbles, balloons, candles, sticks and wall stickers glow in the dark. The disco ball blacklight great for the house party, nightclub, ballroom, bedroom, dance, wedding, birthday party and all kinds of event. 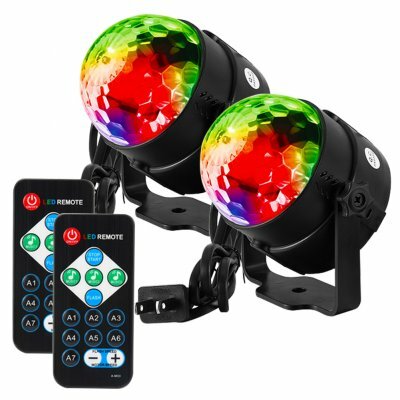 EASY TO USE: A functional remote control is really easy to use, can change the speed and colors of the black light disco ball, create lively visual effects and romantic atmosphere. Mini lights with bracket can be rotated 120 degrees, flexible and practical. Light is purple, People who like a solid color, romantic and simple can choose it. EXQUISITE APPEARANCE: UV Black Light Small Size and Light Weight. MINI light can be placed directly on a table or desk, or it can be fixed on walls and roof. This disco ball light made by high-quality LED light, allow power consumption, long life, compact structure, easy installation and stable performance. WIDELY APPLICATION: This UV blacklight disco ball is a great addition to any house party or gets- together, The mini light design is especially suitable for children's parties. And perfect for discos, prom, birthdays, weddings, holidays, karaoke, DJs, bars, rooms, nightclubs and more. And friends. Made from high-quality material, well-made, durable and reliable. Designed to be a delicate crystal magic ball, make it look fashionable and attractive. 3 work modes, Auto Mode/Sound Active Mode/Strobe Mode, comes with with a functional remote control. Adopt top grade LEDs to present extraordinary scenes, create complicated illumination effects for a romantic atmosphere. An ideal choice for all kinds of a stage or party lighting, such as discos, prom, birthdays, weddings, holidays, karaoke etc.